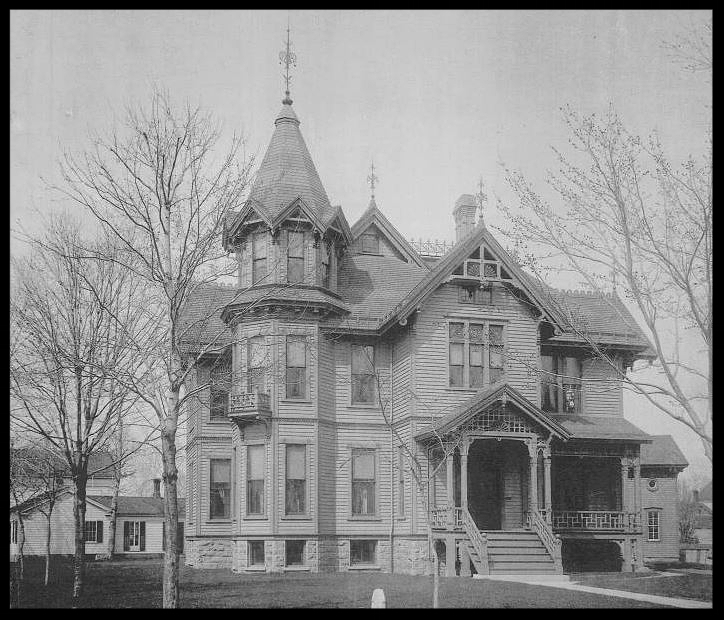 This Queen Anne style home was built in 1884 for John R. Morgan (1833-1906) and Eleanor (Hughes) Morgan (1832-1909). John and his brother, Richard, arrived in Oshkosh in 1855 and founded one of Oshkosh’s earliest and prosperous saw mills, Morgan Brothers & Company. The mill fell victim to financial hardship several times as a result of fires. The Great Fire of 1875 that devastated Oshkosh started in the lumber yard of the Morgan mill. Despite the setbacks, they persevered to become one of the leading saw mills in Oshkosh into the 20th century. To reflect the family’s new-found success and wealth, John hired local contractors Adam Bell and Edwin Cole to design and build this house. The Queen Anne style was the popular choice of architecture in post-Civil War America. The ornately decorated house with 1880s modern conveniences cost approximately $12,000 to build. After the Morgans died, the house was owned for a brief time by their children but was eventually sold outside of the family. Constance Misky bought the home in the 1940s where she operated a cosmetology school on the first floor until 1963 and lived on the second floor until 1970. The Winnebago County Historical and Archaeological Society acquired the home from the Misky family through bequest and purchase in 1987 and began an extensive effort to restore original features of the home. It is now restored and furnished to reflect how a family of the Morgan’s social status lived in late-nineteenth century Oshkosh. The Morgan House was listed on the National Register of Historic Places in 1983.